The Global Volcanism Program has no activity reports for St. Paul Island. The Global Volcanism Program has no Weekly Reports available for St. Paul Island. The Global Volcanism Program has no Bulletin Reports available for St. Paul Island. 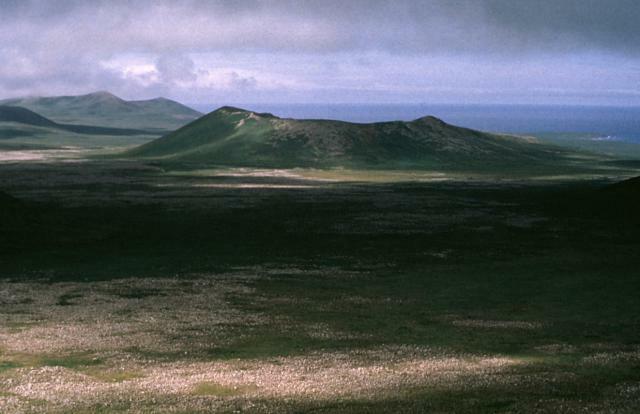 The largest of the Pribilof Islands, St. Paul contains numerous young cinder cones. It consists of a 110 km2 area of coalescing small basaltic-to-trachybasaltic shield volcanoes capped by cinder cones, similar in style to the Snake Rive Plain volcanism in Idaho. The most widely exposed lava flows originated from vents in the Bogoslof Hill area in the center of the island and a row of cinder cones in the Rush Hill area at the west side of the island. Subaerial activity began about 540,000 years ago and produced a basaltic lava platform. Later eruptions produced a series of monogenetic vents and two small shield volcanoes. Bogoslof Hill in the center of the island and Hutchinson Hill, forming isolated Northeast Point, which is connected by a low narrow isthmus to the rest of the island, were formed during the Pleistocene. The youngest vent is the Fox Hill cinder cone on the western side of the island that produced a lava flow about 3200 years ago that traveled into the sea at Southwest Point. Barth T F W, 1956. Geology and petrology of the Pribilof Islands, Alaska. U S Geol Surv Bull, 1028-F: 101-160. Cox A, Hopkins D M, Dalrymple G B, 1966. Geomagnetic polarity epochs: Pribilof Islands, Alaska.. Geol Soc Amer Bull, 77: 883-910. Feeley T C, Winer G S, 2009. Volcano hazards and potential risks on St. Paul Island, Pribilof Islands, Bering Sea, Alaska. J. Volcanol. Geotherm. Res., 182: 57-66. Jaggar T A, 1931. St. Paul Island in the Pribilof Group. Volcano Lett, 335: 1-4. Smith R L, Shaw H R, 1975. Igneous-related geothermal systems. U S Geol Surv Circ, 726: 58-83. Winer G S, Feeley T C, Cosca M A, 2004. Basaltic volcanism in the Bering Sea: geochronology and volcanic evolution of St. Paul Island, Pribilof Islands, Alaska. J. Volcanol. Geotherm. Res., 134: 277-301. There is no Deformation History data available for St. Paul Island. There is no Emissions History data available for St. Paul Island. Lake-filled Crater Hill on the western side of St. Paul is one of many craters dotting the island. Reindeer (caribou) can be seen wading along the shores of the lake. St. Paul is the largest of the Pribilof Islands and consists of a 110 sq km area of coalescing small basaltic shield volcanoes capped by a central cinder cone. The Fox Hill lava flow at the far western end of the island is estimated to be only a few thousand years old. Photo by V.B. Scheffer (published in U.S. Geological Survey Bulletin 1028-F). Crater Hill on the western side of St. Paul is one of many pyroclastic cones dotting the island. 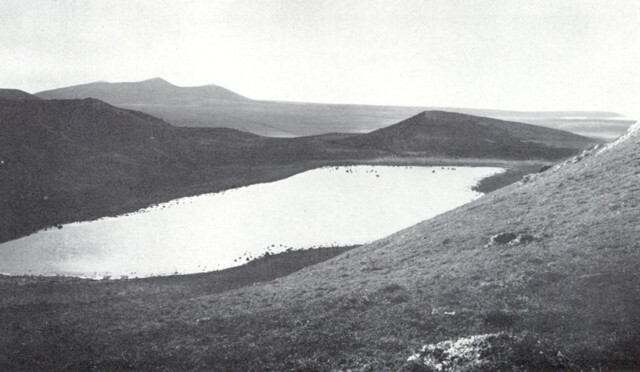 The crater, which contains an elongated lake, is seen here from the NE. St. Paul, the largest of the Pribilof Islands, consists of a 110 sq km area of coalescing small basaltic shield volcanoes capped by a central cinder cone. The Fox Hill lava flow at the far western end of the island is estimated to be only a few thousand years old. Photo by Art Sowls, 1988 (U.S. Fish and Wildlife Service). A Space Shuttle image of St. Paul Island shows Northeast Point at the upper right, Reef Point at the bottom-center, and Southwest Point at the left. 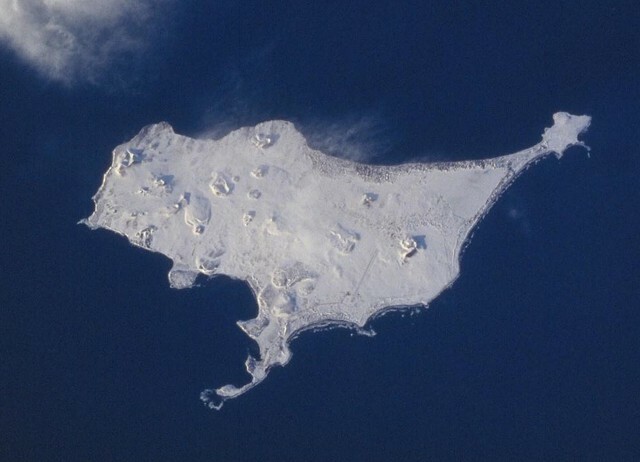 Snow-covered Big Lake lies SW of Northeast Point, Bogoslof Hill near the center of the island, and Rush Hill is the cone along the NW coast. Rush Hill produced lava flows from NE-trending fissures. The 110 sq km island is the largest of the Pribilof Islands and contains more than a dozen basaltic cinder cones and associated lava flows. NASA Space Shuttle image STS099-728-21, 2000 (http://eol.jsc.nasa.gov/). The following 5 samples associated with this volcano can be found in the Smithsonian's NMNH Department of Mineral Sciences collections, and may be availble for research (contact the Rock and Ore Collections Manager). Catalog number links will open a window with more information. Large Eruptions of St. Paul Island Information about large Quaternary eruptions (VEI >= 4) is cataloged in the Large Magnitude Explosive Volcanic Eruptions (LaMEVE) database of the Volcano Global Risk Identification and Analysis Project (VOGRIPA).